The web server used by Certification.info is located in Netherlands and run by Openmatics s.r.o.. This web server runs a few other websites, mostly in the english language. 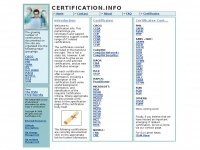 The websites of Certification.info are served by a Nginx server. Both the inclusion of the website in search engines and follwoing of its hyperlinks is explicitly allowed.